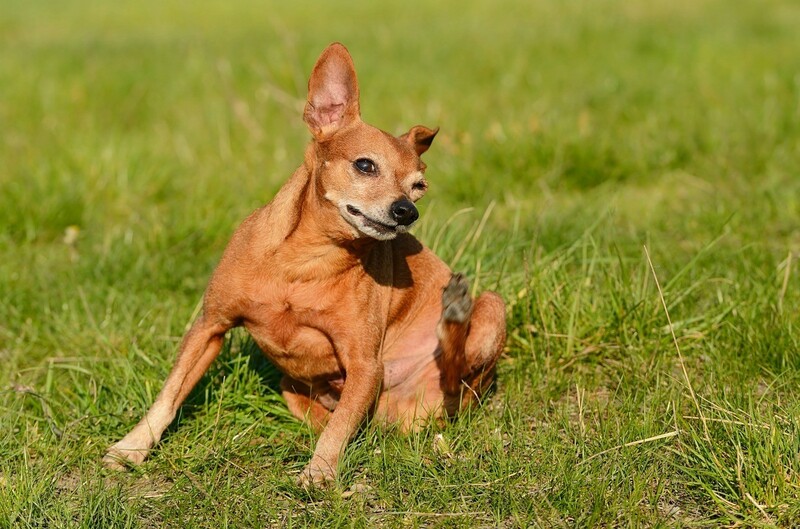 Determining the cause of your pet's itchy skin, is the first step to providing relief. This is a guide about relieving itching for dogs. Can I use Calagel on my dog till I can get her to the vet on Tuesday? She has a rash all over her she is going crazy! She is a Beagle. For all your itchy dog questions: remember the skin is the biggest organ in the body and it is first to show trauma in the system. Skin allergies are usually diet related. Wheat, corn and soy are the three biggest allergens in dogs and you'll find these as the top 3 ingredients in most dry dog foods. Eliminate these three ingredients, find a food that is human grade and grains free - this is what is biologically appropriate for dog's diet. Most skin issues will vanish in 2-3 months (takes time for the body to detox and regenerate). Vets have no understanding of diet and recommend things I wouldn't feed to my worse enemy. Also a lot of personality issues calm down or go away when diet is corrected. Lastly, find a holistic vet who can advise you of holistic ways to increase your pet's immunity and health without the toxic effects of western medicine. Regular vets (and MD's) "bandaid" problems or slash, burn and toxify while Holistic Vets (and ND's) seek to find a root cause and cure the problem. It's time for a whole new way of thinking for us and our pets! Also recommend Gold Detox Kit from Amber Technology - it detoxes and regenerates all the body's organs and systems with an organic, non-toxic product. Very inexpensive for the results. Recommend doing it once a year. Dog's bodies are designed to live 25-30 years - we are the ones shortening them by poor nutrition and over vaccinations (read "Stop the Shots! : Are Vaccinations Killing Our Pets!" and "Food Pets Die For" to understand diet). I found out from my vet my dog is not only allergic to flea bites, but to freshly mown grass and to keep him off it for 24 hours after being mowed. I have a tiny 3 year old Beagle. She seems to have a perpetual itching problem, sometimes so severe that she whines loudly. She has been identified with mange and was treated with medicines (antihistamines) and medicinal rinses for it, but her condition has stayed the same. I really pity her when she scratches herself near her lower jaw and screams. Her lower jaw and ears, which are her major scratching spots, are slightly red now and she has also lost some of fur due to this. I have a 7 year old black Labrador, too. Lately she has started to have patches of dry flaky skin. Her fur comes out in tufts when she is scratching herself. She is always biting and licking herself on different spots on her body, mainly under her lower belly. Will olive oil or cod liver oil help? Can someone help me please? The itching could be caused by a flea allergy. My cat Skooter has a horrible flea allergy and was always scratching himself until I got him on Advantage Flea Preventive. Advantage is sold for dogs, too. As a matter of fact, 1 tube of Advantage for dogs, a blue box, can be divided into 10 .4 ml. doses for cats for huge savings and this is what I do for my cats. I have given dogs a tablespoon of veggie oil daily to help prevent dry skin and it has worked. If the itching is bad, the vet should be able to give the dog(s) a shot to stop the itching. Fish oil capsules and flax seed capsules. You can give them what you give yourself and not buy the expensive ones at the vets. Sorry to hear about your pups. Our Airedale had terrible itching and scratching due to allergies and hotspots to the point where he would bleed from the gauges and we had to put a cone on his head. His scratched his underbelly, back, head, everywhere. We tried everything for years, shots, prednisone/cortisone, tea tree oil, hydrocortisone creams, even benedryl didn't touch it, etc. It wasn't until we started giving him fish oil capsules and flaxseed capsules that it stopped almost totally. We gave him the ones from Sam's, but you can get a great deal on "buy one get one free" at drugstores. They work in the body from the inside out and are an anti-inflammatory. The vet was impressed and so were we. We didn't want to keep him on prednisone as that is hard on the liver. I hope this at least might give your pups some relief. It won't cure the mites, but might help with the inflammation they cause. Try changing their food. I had several dogs that the vets were charging me major bucks for this and that for dry skin then on a spur of a moment switched foods. I was in a sporting goods store with my husband and we started talking and the man and I got onto dogs and I mentioned my dogs itching he mentioned a product called Sportsman's pride or Black Gold he said that's what he fed all his dogs. It cured my dog's itch and it is a good food all the way around. I now have 12 dogs and 16 cats and that's all I feed them and they love it and won't eat another brand. Definitely watch out for food allergies, particularly corn in dog food. Also, check out earthclinic.com online. They have a pet section that talks about these sort of things a fair amount. Vitamins for your pets are wonderful, esp Es and Omega fish oils daily. My 8+yr old German Shorthair has eyelash length hair. We have no problem if we keep her clean. Her bath cleaner is J&J Baby wash. It has been for all her life. My allergies demand a clean dog and she loves the shower. We don't use anything with a scent to it, she has similar allergies to what I do. Even when the guys take her out to run her, etc. she gets a shower afterwards. Summertime, the little 4 ft pool is set up to rinse feet in. The kids run in and stay cool, etc. I sometimes find the dog doing her roll in the water instead of the grass. Oh, my dog also loves to be vacuumed. Turn it on to use it on the floors, she is right there for her turn. We have four dogs. Two golden retrievers and two small poodles.